You may have heard about Gov. Rick Scott’s plan to increase public education funding by $1 billion. Suspicious yet? You should be, because Scott is getting this “new” funding by cutting Florida’s Medicaid program, which coincidentally provides essential health care to hundreds of thousands of children in our state. And in case you forgot, Scott had proposed a whopping $3 billion cut to public schools last year, and the Legislature gave him a giant $1.3 billion. Scott’s “increase” even if it made it into the state’s budget, wouldn’t replace all the funding he and his buddies in the Legislature cut out last year. There’s a better, fairer way to balance Florida’s budget that protects our children from schemes like Scott’s: making wealthy corporations pay their fair share. 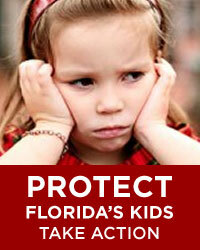 Progress Florida launched a petition yesterday to demand a fair budget that stops cuts to children’s health care. Click here to sign it and then please share it with your friends and family! The Working Families Lobby Corps Session Update Returns!